Along with ample street parking, there are numerous public garages available. 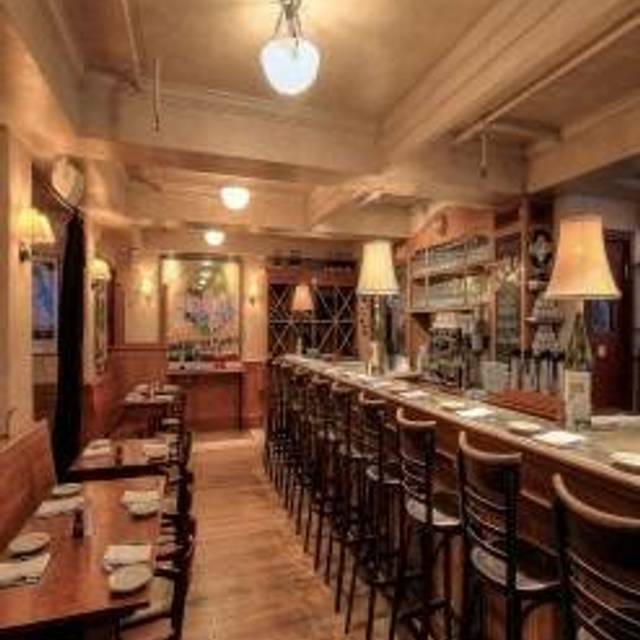 Located in the heart of Pike Place Market, Campagne offers an exquisite and unique atmosphere in which to host your next private function. Your guests can be assured of authentic and imaginative cuisine served by a consummately professional staff. Our menus are inspired by the cuisines of Provence and Southern France. Whether you're planning a formal business luncheon, a relaxed afternoon reception, a dinner for valued clients, or a gathering of friends and family, our space can accommodate your needs in a variety of arrangements and options. The heart of France in the heart of Pike Place Market. 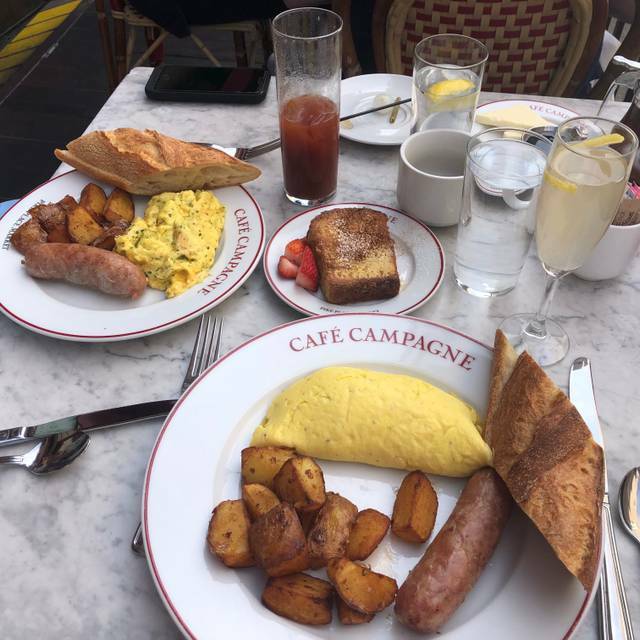 Café Campagne has been charming visitors and locals alike since 1994. The menu highlights the classics... Steak Frites, Oeufs en Meurette , Duck Confit, Salade Nicoise, Cassoulet (October through April)... pairing perfectly with our wine list which offers a wide variety of French selections alongside local superstars. 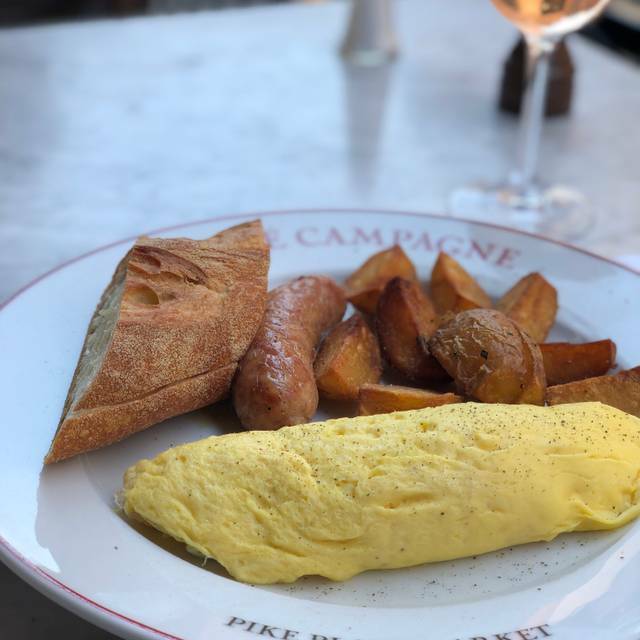 Stop by for our ever-popular brunch on Saturday & Sundays, a night out under the iconic Pike Place Market sign, or just a small bite for happy hour on our patio. A Parisian café tucked into Pike Place Market’s Post Alley, not to be missed! Poached eggs with a sauce of pearl onions, bacon, champignons in red wine – foie gras sauce on garlic croutons, pommes frites. French rolled omelette filled with herbs, escarole, and chevre cheese, served with chicken and pork sausage, roasted potatoes and baguette. Scrambled eggs with fresh herbs, served with chicken and pork sausage, roasted potatoes and baguette. Grilled, served with balsamic onions, roasted red peppers, garlic aioli & pommes frites. Tuna baguette sandwich with hard-cooked egg, tomato, lettuce & olive tapenade, with carrot salad. Parisian ham & comte cheese. Parisian ham & comte cheese with a fried egg. Parisian ham & comtè cheese with tomato. Fried‎ in bourbon egg batter, served with maple syrup and topped with fresh fruit. Side of French French Toast Brioche. Seasonal vegetables & comte cheese, with green salad in sherry vinaigrette. Dungeness crab, sweet onions and comte cheese, with green salad in sherry vinaigrette. Country-style pork and chicken liver pate. Citrus & vodka cured salmon with salmon rillettes & fennel, red onion, citrus salad, demi-baguette. Southwest French white bean stew with lamb, pork, duck confit and garlic sausage. Mixed greens in sherry vinaigrette. St. jude’s tuna served with fingerling potatoes, hard-cooked egg, tomatoes, yakima asparagus, olive tapenade & anchovies. Country-style‎ pork and chicken liver pate. Squid sauteed with olive oil, garlic, parsley, capers and lemon. Savory bacon, onion and goat fromage blanc tarte. Selection‎ of french cheeses, confiture. Parisian ham and gruyere on pain de mie. Parisian ham and gruyere on pain de mie with a fried egg. Parisian ham and gruyère on pain de mie with tomato. With extra virgin olive oil and dijon mustard. Melted comté de gruyere with dijon mustard. Goat cheese baked on croustade with frisée & arugula in scallion vinaigrette. St. jude’s tuna served with fingerling potatoes, hard-cooked egg, tomatoes, green beans, olive tapenade and anchovies. Warm‎ salad of boneless duck leg, cabbage, bacon, shallots, and garlic, flavored with sherry vinegar, topped with goat cheese, toasted pine nuts and duck liver toasts. Seasonal vegetables & comté cheese, with green salad. Dungeness crab, sweet onions & comté cheese, with green salad. Poached eggs served on garlic croutons with pearl onions, bacon and champignons in red wine-foie gras sauce with pommes frites. Grilled lamb burger with grilled balsamic onions, roasted red peppers, aïoli and pommes frites. Pan-roasted‎ hanger steak with blue cheese butter and pommes frites. Country-style pork and chicken liver. Wild burgundy snails baked with parsley, garlic and shallot butter. Squid‎ sauteed with olive oil, garlic, parsley, capers and lemon. Beef rib-eye, shallots, capers, dijon, quail egg, served with toasted baguette slices. 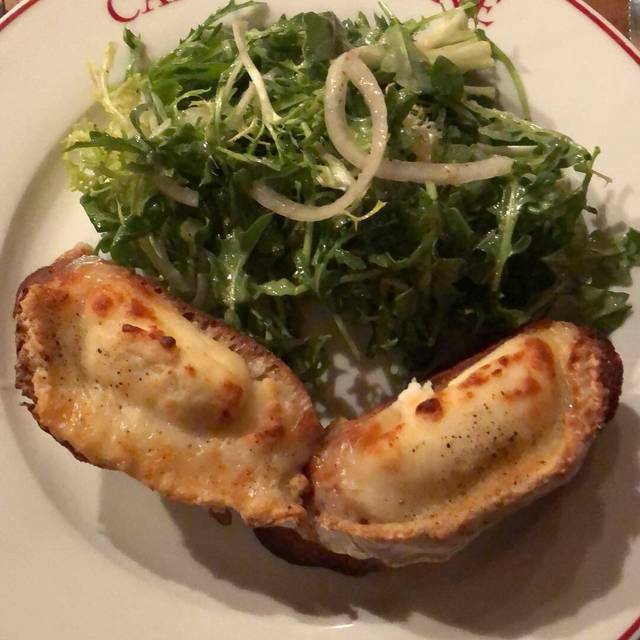 Goat cheese baked on croustade with frisée and arugula in scallion vinaigrette. Roasted beets, frisee, fromage blanc, citrus-marinated onions & toasted hazelnuts. Green beans marinated with lemon-shallot vinaigrette topped with grilled bacon. Warm salad of boneless duck leg, cabbage, bacon, shallots, and garlic, flavored with sherry vinegar, topped with goat cheese, toasted pine nuts and duck liver toasts. Pan-roasted half chicken, natural jus, served with roasted potatoes and roasted shallots. Please allow 30 minutes. Crispy duck leg confit served with thyme skillet potatoes. Grilled lamb burger with grilled balsamic onions, roasted red peppers, aioli and pommes frites. With blue cheese butter and pommes frites. Sauteed boneless trout with salt-roasted potatoes and almond, lemon and brown butter pan sauce. Steamed Mediterranean mussels with onion, celery, white wine, herbs and butter. We used to eat here a lot. The food was always good. Then we started going other places for variety. Last summer we were walking in Post Alley, and there was a seat outdoors. We sat and ate a wonderful lunch and watched all the people walking by. We were reminded how much we loved that this place. We were taking a guest to dinner during restaurant week and this was my first choice. Some of the most woderful food i fhave had in Seattle. We will frequent here often. 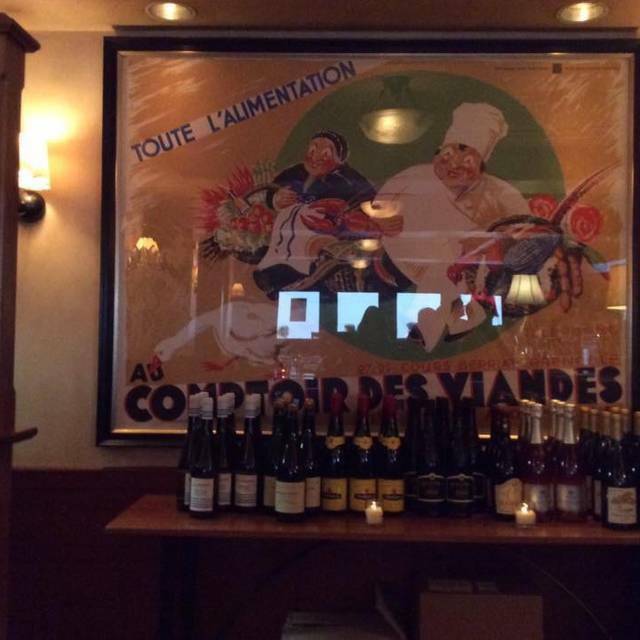 We had the Prix Fix menu for Seattle Restaurant Week. Everything was delicious. The wine was outstanding. Our server appeared a overwhelmed and forgot our bread, walked by us several times without taking our check/cards to pay. He was very nice but seemed frazzled. Delicious food, lovely service, a room that feels like Paris. Delish, again! The conscientious, gracious service here matched by a menu with authentic French dishes that are consistently excellent make this one of my Seattle favorites. Breakfast, brunch, lunch or dinner are all superb. 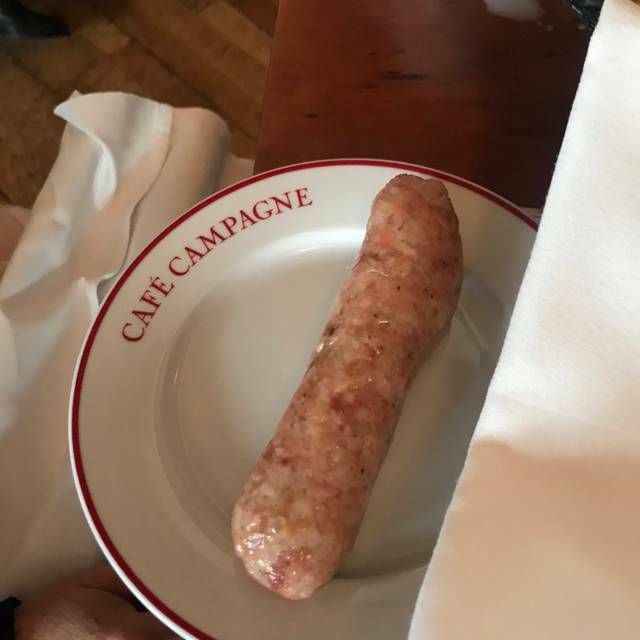 Merci bien, Cafe Compagne! 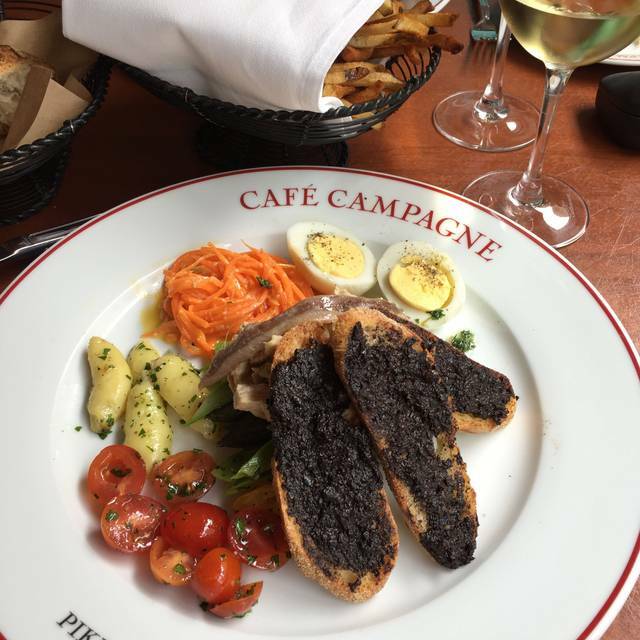 Cafe Campagne is my "go -to" place to take out of towners. I also love it for special meals. It is always, always delicious. Or, it was until yesterday when the food was just a step above average. It was also crowded and noisy. We had reservations and were seated immediately despite the long line. Wonderful! But our food was disappointing. I do not know if this was a one off or they have a new chef. We will try it again sometime and will hope the food returns to being Outstanding! Can’t say enough good things. Service is always excellent and food deeelish. Sad that Cassoulet season is ending. We ate one and ordered another to go. I have been a regular here for many years. I think the quality of the food and each ingredient is very good. I love the Croque Monsieur and the crisp salad with a tangy vinaigrette. The Pomme Frites are amazing, so share a basket with your table as it is a huge portion. For a moment I thought I was in Paris! Good food and great service. Exceeded our expectations. Excellent food professional service even though it was packed. I went here two out of three nights while in Seattle. I love the location, the cozy, quiet, friendly atmosphere. The food was great. The crime brûlée has the thickest burnt sugar coating : yum! And the chocolate mousse very dark. service was very good also ..
We LOVE Kaylen. And how pleasant, on a dreary Friday, to have the back dining room to ourselves with Kaylen taking good care. Cafe Campagne never fails to please. Love those eggs! 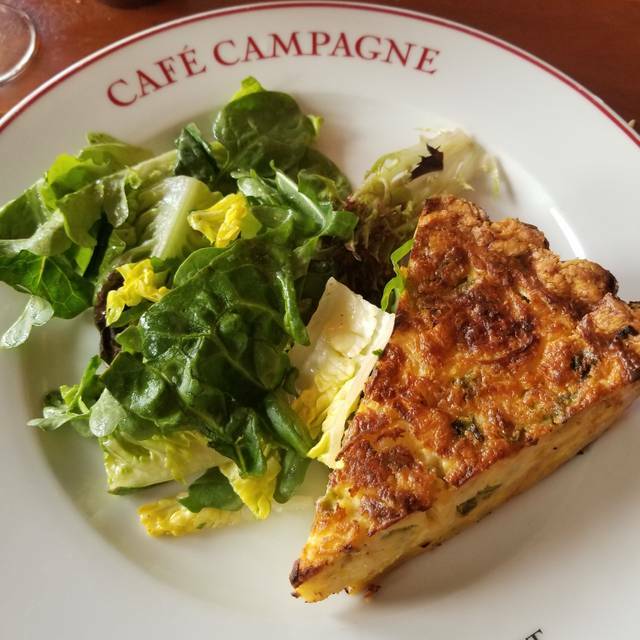 I would and have recommended Cafe Campagne to many friends and family. I loved our waiter, Victor. He was friendly, attentive, and made us laugh. The calamari was delicious and I highly recommend dipping your bread in the sauce! 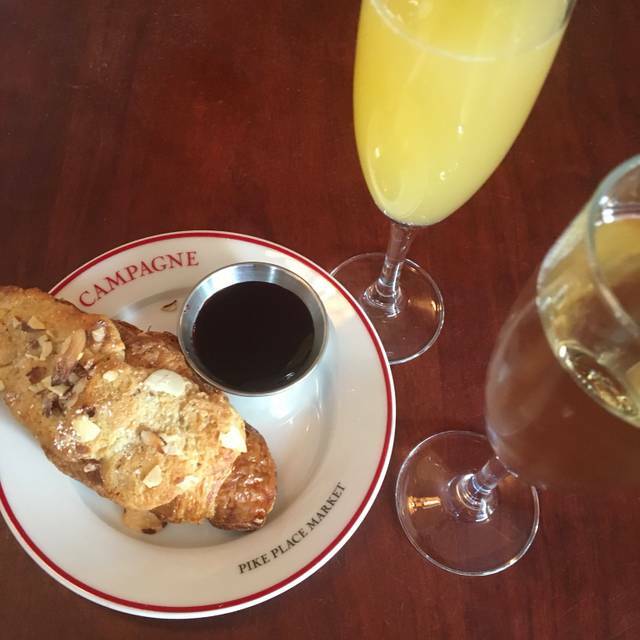 We went to Cafe Caanpagne before a symphony performance and found it to be the perfect spot. Service was prompt and effecient. I had the Roast Chicken and it was the best roast chicken I have ever had.............it was sooooooooo good! Lively and lovely place for brunch. Excellent quiche of the day and great location. Friendly staff. This little cafe in the Pike Place Market has stood the test of time. Furniture, decor, tiled floors do evoke neighborhood Paris cafe ambience. Lyonnaise salad, salmon, seafood stew all excellent along with chewy substantial bread. Refills on bread offered. Attentive service. Quiet. Nice for couples/adult meals. Lots of seating at the bar. Happy Hour specials too. Great waiter! Really nice place; almost believed I was back in Paris for a while. Genuine French food, fabulous French bread and people that really make an effort. No obnoxious music in the back ground -- a great place to relax, eat and talk. Will definitely be a repeat customer! Food was very tasty, but the soup I ordered came cold and was served before our bottle of wine was delivered/opened to drink with it. French red wine was delivered with white wine glasses which we also had to point out. Despite not being very busy, we seated next to a large and noisy party. We asked to be moved (we couldn't hear ourselves think much less talk) and were accommodated. Despite these hiccups (lack of attention to detail) it was a good meal and evening. The food was amazing! Absolutely delicious and worth every penny 😍 I'm definitely looking forward to my next dinner here! fav date night place in seattle! This place is always “impec”! Food is consistently delicious and the service is perfect. Can’t wait to return. LOVED! Can’t wait to come back. The menu looks fantastic but the food is not fantastic. A missed opportunity to offer great traditional french cuisine. Ambiance is great. My son & husband dream of their Cassoulet! It is serious comfort food! Every bite gets better & each layer of flavor earns an Ooooo & Ahhhhh. Always a great time. The service was spot on. The ambiance delightful. Made meeting with friends very enjoyable. excellent food in an inviting room. We had quiche of the day, croquet madame, and a fresh salad. All were excellent. I hadn't been here in awhile, the experience will bring me back soon. Love this place! Great atmosphere and service. Everything we had was wonderful and priced fairly. Getting together with granddaughter and boyfriend after long absence. They loved their dining experience and the waiter was awesome and made us all feel welcome and honored guests . I re-located here in 2018 and my friends love to visit. My boss recommended this restaurant and I’ve brought my visitors here ever since. I LOVE THIS PLACE. The chicken sausage is amazing from the brunch menu. I highly recommend this to everyone in WA. Our server Chad was super nice, anticipated every need, and made sure that we were taken care of! The food was sumptuous, the libations delicious. I recommend the lamb burger anytime! Wonderful experience. Met friends for San Diego and totally enjoyed our evening. EXCELLENT French Onion Soup, delicious and varied menu, and terrific Pavlova for dessert! Simply divine. Fabulous cocktails and wine, impeccable service, and charming atmosphere! Always reliable and always impressive. LOVE this place. It feels like I’m dining in Paris. Perfect. The food was fantastic, and undoubtedly the kitchen is well run by an executive chef with talent and passion. However, I was not impressed with the service. The front of house staff seemed bored and unenthusiastic about creating a complete guest experience. Please consider training your wait staff to be more attentive and engaging.